This is Mega Man's basic weapon. 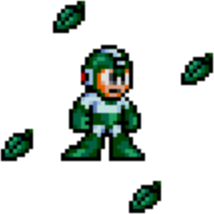 It fires a single bullet, although Mega Man can fire up to three of these bullets on the screen at one time. Mega Man starts his adventure with this weapon and no other. It cannot be charged in this game as it can later in the series. Mega Man acquires a special weapon from every Robot Master he defeats. Each special weapon is especially effective against another Robot Master. See the #Damage charts (full of spoilers!) at the bottom of the page. The Air Shooter is acquired upon the defeat of Air Man. When fired, it releases blasts of compressed air which turns into three small tornadoes. These tornadoes travel out from Mega Man's position and arc upward, eventually disappearing off the top of the screen. It is an effective weapon against airborne enemies. 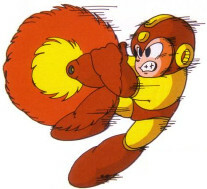 The Crash Bomber fires a small bomb in a straight line from Mega Man's position. In addition to damaging enemies on contact, it will also attach itself to almost any surface and then explode a few seconds later. This weapon also makes a useful tool for reaching items and shortcuts which are blocked by special barriers in Flash Man's stage, Heat Man's stage and in Dr. Wily's Fortress. Acquired after defeating Flash Man, this is more of a tool than a weapon, as it effectively damages very few of Mega Man's enemies. 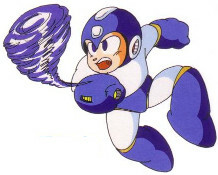 Rather, Mega Man uses the Time Stopper to freeze all enemies on the screen, allowing him to simply avoid battling with them. Once the Time Stopper is activated, its time-freezing effect cannot be cancelled until the weapon's energy is completely exhausted. Quick Boomerang rapidly fires boomerangs in a tight arc in front of Mega Man's position. 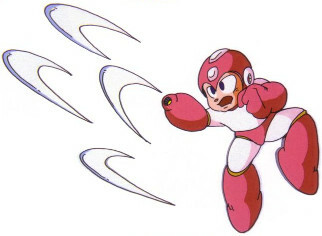 The weapon effectively creates a wave of boomerangs in front of Mega Man. The boomerangs don't travel very far, but they can be effective for attacking enemies which are just above or below Mega Man's position. The Metal Blade is gained after defeating Metal Man. 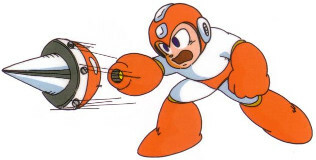 Using this, Mega Man can fire a circular saw blade in any of eight directions, simply by holding the desired direction of the D-Pad while firing. Firing the Metal Blade uses relatively little weapon energy. 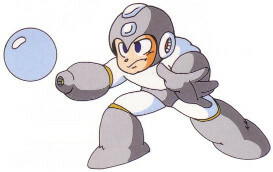 Because of its multidirectional capability and since it is effective against almost all of the game's enemies, the Metal Blade is a very useful, and over powered, weapon in Mega Man's arsenal. Bubble Lead is affected by gravity and rolls along the ground until it contacts an enemy or an immovable barrier, or else falls off the screen. It is effective for attacking enemies which are below Mega Man, or which are too close to the ground to be easily targeted by other weapons. This weapon is gained after Heat Man's defeat. The weapon can be charged by holding before releasing, which can result in three different-sized fireballs. The larger the fireball, the more weapon energy is used. Atomic fire has three forms: the first and weakest form is created by tapping the button that does little damage and uses little energy. The next form does moderate damage and uses a little more energy than the first form. The final form does the most damage and uses the most energy and it is also the largest form. 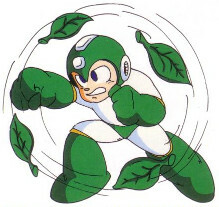 The Leaf Shield is gained from Wood Man and can be used for defense or offense. 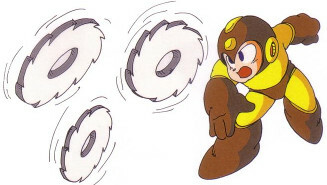 When activated, it creates a circle of indestructible leaves which surround Mega Man. 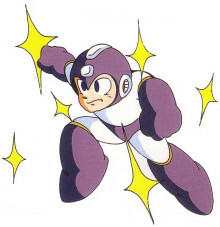 Enemies contacting the shield will sustain damage, but Mega Man must stand motionless or else the shield will fly away from his body. Once the shield is activated, simply pressing a direction on the D-Pad will cause the shield to fly in that direction, still damaging enemies as it goes. If Mega Man jumps, the Leaf Shield will travel directly upwards. The chart below lists the damage dealt by every weapon (on the top) to every Robot Master (on the left). The weapon obtained by each Robot Master is highlighted in red; the weapon(s) that deal the most damage are higlighted in green. In the NES Western "normal" mode the damage is doubled. This page was last edited on 1 February 2017, at 16:56.